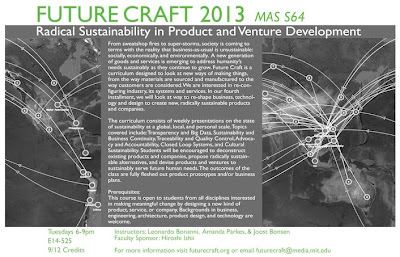 My entrepreneurial colleagues Leonardo Bonanni, Amanda Parkes, and I with the support of Professor Hiroshi Ishii are offering Future Craft 2013 ~ Radical Sustainability in Product and Venture Development on Tuesdays 6-9pm starting September 10th. In this fourth installment of Future Craft, we will look at way to re-shape business, technology and design to create new, radically sustainable products and companies. Business-as-usual is unsustainable -- socially, economically, and environmentally -- so new generations of goods and services are emerging and Future Craft will look at new ways of making things, from the way materials are sourced and manufactured to the way customers are considered. We are interested in re-configuring industry, its systems and services.